We’re taking a quick little break from all the sugar today. And according to my rules for christmas (and really all) entertaining, there must (must!) be appetizers with cheese. In addition to a cheese plate. I told you I like cheese. 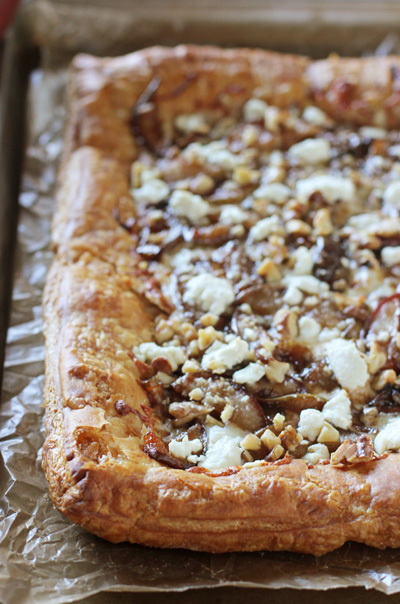 Bonus points if you put the cheese on top of a buttery tart. Hard to go wrong, no? One of my favorite topping combinations for pizza is sliced pears, walnuts and goat cheese over a dough that’s been brushed with olive oil and sprinkled with some mozzarella. It’s so simple yet so ridiculously good. So I took it one step further and used that same combo on top of flaky, butter-filled puff pastry. And I caramelized the pears with some brown sugar and cinnamon. It was just begging to be done. All leading to an appetizer that is easy, doesn’t have a lot of prep, and yet is irresistibly good. One last little suggestion. If you can, spring for the all butter puff pastry at the store. It is just light years better when you go for the kind with all butter. And last but not least …. I can’t tell you how much I’ve loved reading all the holiday traditions you’ve shared over on the giveaway that’s currently going on! Not only do I appreciate you sharing your traditions with me but ummm I now have a list of about 20 more traditions I want to start. Shhh, don’t tell my husband! Oh wait, he reads the blog. Drats. 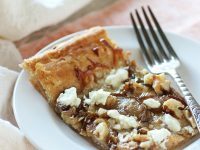 An easy appetizer recipe for pear, walnut and goat cheese tart. 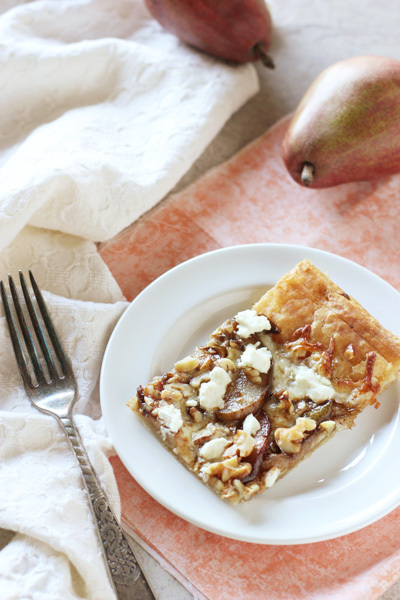 With a puff pastry crust and topped with caramelized pears, cheese and nuts! Preheat the oven to 400ºF. Line a large baking sheet with parchment paper and sprinkle lightly with flour. Set the puff pastry on the baking sheet and roll out to about ¼ inch in thickness. Brush the pastry lightly all over with the olive oil. Bake for about 12 to 15 minutes, until golden brown and puffy. Remove from the oven and carefully press down the center of the pastry a little bit (leaving a sort of border around the edge), so the topping has a place to sit (it will be hot – so don’t use your hands!). Meanwhile, set a medium skillet over medium heat. Add in the butter. When melted, add in the pears, brown sugar, cinnamon, nutmeg and salt. Cook for about 8 minutes, stirring occasionally, until the pears are tender and caramelized a bit. Remove from the heat. 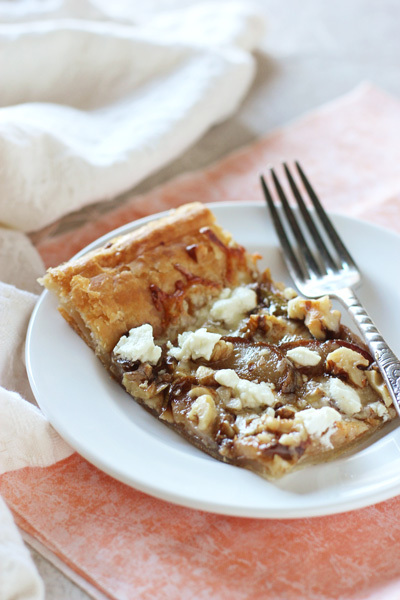 Sprinkle the baked tart crust with the mozzarella cheese, then top with the cooked pears, the walnuts and goat cheese. Return to the oven and bake for about 8 to 10 minutes, until the cheese is melted and the crust is deep golden brown.